Sunday services are held at 10.30 a.m. and 6.30 p.m. We express our worship through a mix of traditional hymns and modern songs along with preaching that explains and applies God's word, the Bible. A crèche is available during the morning service and we invite you to join us for refreshments afterwards. Once a month we share in the Lord's Supper during the morning service. We celebrate Communion (the Lord's Supper) to remember the death of Jesus. This is normally on the second Sunday morning and the fourth Sunday evening each month — see the LCBC Diary for details. SClub is a teaching and activity session for the children that runs at the same time as the morning service, with an all-age service instead a few times a year. 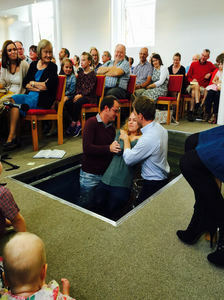 Christians are encouraged to witness to their faith in Believers' Baptism and these services are always special occasions. 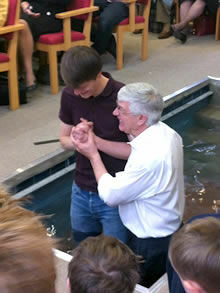 If you are interested in being baptised, please speak to one of the Pastors. For ways to contact us see our contact page.